Download The Strain in Digital HD from the iTunes store. The Strain images are © 20th Century Fox. All Rights Reserved. Nowadays, vampire television, films and series are a dime a dozen; but, when someone like director Guillermo del Toro puts his name on something, it causes one to pause and pay attention. Such is the case with The Strain, the new series by FX and Guillermo del Toro, based on the trilogy of books written by del Toro and Chuck Hogan. This new twist combines vampires with "The Walking Dead" kind of feel. These vampires don't sparkle or walk in the sun and have more zombie-like qualities than some others of this decade. They feed by suckers that come out of their neck (a la Blade 2), adding an element of creepiness to the show. When Dr. Ephraim Goodweather (Corey Stoll; Non-stop) of the Center for Disease Control is called in to investigate a dark plane, where it seems all the passengers were dead upon landing, he realizes there is more to the story. Eventually, he teams up with Abraham Setrakian (David Bradley; Captain America:The First Avenger), who has been aware of the vampires since the Nazi Concentration Camps. Together, they are attempting to locate and kill the Master (Robin Atkins Downes, Prometheus) in order to stop the vampires. While the premise of The Strain seems to be a little different than your standard T.V. fair, it does take a while to peak ones interest. The show starts off very slowly and after many hours of binge watching you find that you are hooked! It is really hard to pin-point what makes the strain engaging, but the characters are extremely fleshed out, and their back story continues to unfold with each new episode. Each show moves the plot forward without backtracking or rehashing of any previous episodes, and it feel like this could be a real world event instead of something that is pure fantasy. However, the character of "The Master" can and often does take one out of the show. While "The Master" is supposed to look terrifying and menacing, most of the time, it looks like a horrible mask. The latex and CGI just do not make for a menacing character. For me, the actual sucker from the drone- like vampires is actually more menacing than the all-powerful "Master." The Strain is present in 1080p, 1.78:1 aspect ratio, and while the AVC codec delivers a sharp picture most of the time, the blacks seem to be very lacking and there is quite a bit of noise on the final product. On the same note, while not lacking, the lossless DTS-HD Master Audio 5.1 does not really pack a punch. It provides clear dialog and some surround effects, but not much. In addition to the special features included on the vanilla release of The Strain, the premium master collection also included audio commentary on "Night Zero" by del Toro, deleted scenes, a gag reel, and "Here He Is", a profile on the Master and his design. 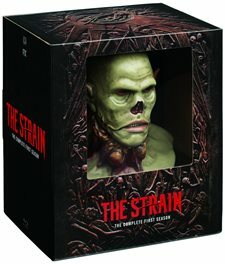 The Premium Collector's Edition of The Strain houses the Blu-ray discs in a plastic bust of The Master. 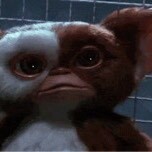 While not the same quality of something from Sideshow Collectibles (and considerably a lot less money! ), it makes a very nice addition to anyone Blu-ray collection, or a standalone piece on a bookshelf. While The Strain's first season will never go down as ground breaking television, or vampire lore, it is a nice addition to both. If you are a fan of Del Toro, or just like good story telling, I would give the show a chance. And, if you haven't purchased The Strain yet, The Premium Collection Edition is definitely the way to go. Otherwise, pass on the double-dip. Watching for @FlickDirect Not sure how this will go.